Tyburn on this date three hundred years ago saw the hanging of two women, both transgressors of the booming capital’s purported sexual mores. She was, in fact, a whore, as would be obvious to any 18th century cad by the cursory narration of her trial: a fellow named Sampson Barret “depos’d, that going through Drury Lane at about 11 o’Clock at Night, there was 6 or 7 Women kind standing together, who divided and made a Lane for him to go through them” whereupon Elizabeth Cave followed him and picked his pocket. Now, with apologies to the children’s rhyme, there’s really only one reason a guy would be traversing Drury Lane at 11 o’clock at night and that he’d bump into six or seven women on his way … and baked goods weren’t the reason. 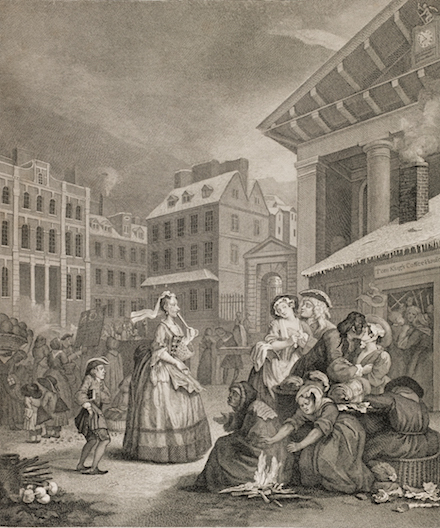 In the “Morning” plate of William Hogarth‘s Four Times of the Day cycle (above), men rendezvous with prostitutes outside a notorious Covent Garden dive, Moll and Tom King’s Coffee House. 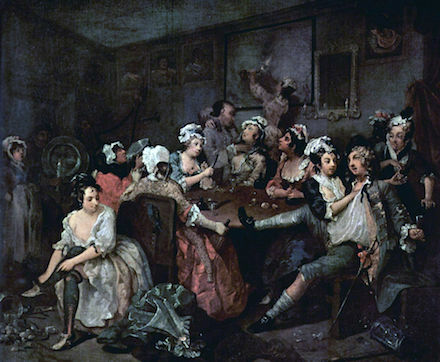 We catch an interior glimpse of this same environment in plate three of Hogarth’s A Rake’s Progress, wherein said rake frolics at a Covent Garden brothel (below). Unsurprisingly, venereal diseases such as that suffered by Elizabeth Cave were quite common among the more proletarian pros to be found at an hour to midnight on Drury Lane; nevertheless, they had no shortage of customers. If Cave did indeed rob this passing john, it was unfortunate for her that she took currency. In order to save small-time criminals from the gallows, juries routinely applied “pious perjury” to downrate the value of stolen objects below the absurdly low one-shilling (12-pence) threshold for felony larceny; such maneuvers were obviously impossible when it was actual shillings that had been pilfered.